The sequel to one of the most beloved JRPGs of all time is hitting the PlayStation Network - but for the moment, it's only in Japan. The 1995 SNES classic JRPG Chrono Trigger is one of my favorite games of all time. It's a sterling example of how good a Japanese RPG can be, and it is widely held up by many as one of the best videogames ever created (because it totally is). Its PS1 sequel Chrono Cross was never quite as legendary, but it was still a very strong showing - and to this day, it has one of the best soundtracks ever heard in a videogame. Unfortunately, it's also pretty hard to find a copy of, these days. On the other hand, that makes the announcement that Square-Enix will be putting Chrono Cross up for download on PSN all the sweeter. According to Andriasang, the announcement that Chrono Cross would be joining other Squeenix legends like Final Fantasy IX and Final Fantasy VII on PSN came as result of the Japanese Square Enix Members Twitter account reaching 20,000 followers. Whatever the reason, this is still great news. 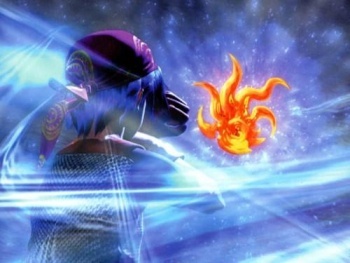 It has not yet been announced whether Chrono Cross will show up on PSN in North America and Europe, but given that Squeenix's previous PSN releases have crossed the ocean it seems likely. If so, this will be a first for Europeans: Chrono Cross never saw a European release. I've always said that Chrono Cross was "an amazing game, but a horrible sequel," and I still hold that to be true. Even if it isn't as superb as Trigger, it's still a classic in its own right. Square-Enix also reportedly has another announcement waiting in the wings to celebrate its 20,000-follower milestone, an announcement that isn't a downloadable game. I'd given up hoping for a third Chrono game years ago, but wouldn't it be cool if it were?